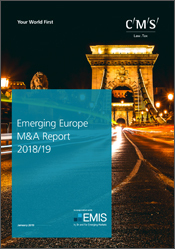 2018 was another banner year for dealmaking in emerging Europe, according to CMS’ Emerging Europe M&A report. Last year, deal value in the region grew 12.5 percent reaching a total of €80.5bn. It was the second highest level in the past five years, thanks to a number of mega deals, including Vodafone’s €6.07bn purchase of Liberty Global’s CEE operations. Deal volume, however, remained flat: 0.9 percent own on 2017 with 2093 transactions. The region has demonstrated remarkable stability in recent years, despite the ongoing uncertainty permeating the global economy and ongoing political instability in key markets, such as Poland, which was the second-most active country in the region, attracting 323 deals in 2018. Russia, which is included in the report, was the most targeted with 605 deals. Poland’s real estate and construction sectors were the most targeted, accounting for nearly a quarter of all deals in the country. Poland also saw seven of the 20 biggest property deals in the region, including the acquisition of the Wars Sawa Junior shopping centre, bought by Atrium European Real Estate of Austria for €301.5m. Romania also saw a 73 percent jump in deal value last year due to a notable increase in telecoms sector activity. Deal volume fell, however. Across the region, real estate was the most active sector, with 432 deals recorded, up 10.8 percent on 2017. Telecoms and IT recorded the highest total deal value, at €18.18bn. The UK was the top foreign investor in emerging Europe, by value, investing €9.77bn. The US was the top foreign investor by volume, with 89 deals. Whether the current levels of activity can be maintained in 2019 remains to be seen, particularly in light of current economic uncertainty. Regardless, 2018 was an impressive year for the region. Bristol-Myer Squibb is to acquire Celgene Corp for $74bn in a cash and stock deal which combines two of the biggest pharmaceutical companies in the world. The deal will see Celgene shareholders receive one Bristol-Myers Squibb share and $50 in cash for each share held, or $102.43 per share, a premium of 53.7 percent to Celgene’s closing price on the day before the deal was announced. The boards of directors of both companies have approved the deal, which is expected to close in the third quarter of 2019. The Celgene/Bristol-Meyer deal is the second notable merger to be announced in the pharmaceutical sector recently, following news of the $8bn merger between Eli Lilly & Co and Loxo Oncology announced on Monday.